Happy Friday everyone! Here’s a quick little note to tell you about the “new” dish. I spent some time this week revamping my blog with some new features and a different look. 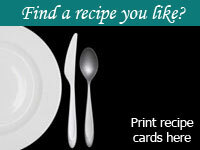 I am currently in the process of creating recipe cards and adding the “print this recipe” button to prior recipes but should be finished sometime this weekend. Stay tuned for my next posts about our Memorial Day Weekend Trip and the Hood River Beer & Wine Tour! Questions? Comments? Feedback? I’d love to hear from you!